If you only have time for one day trip from Barcelona, the mountaintop monastery of Montserrat is a must, but many tours only offer a whistle-stop visit. 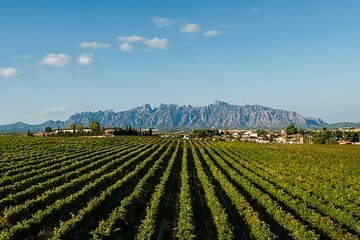 This private full-day tour from Barcelona offers ample time to explore Montserrat and hear the famous choir, followed by a cava tasting tour of the Penedes wine region. Hotel pickup and drop-off are included. Begin your guided tour to Montserrat with pick-up from your central Barcelona hotel between 8.30 and 9.30am and settle into your private vehicle for the scenic 45-minute drive to Montserrat. Admire jaw-dropping views of the Catalan countryside as you wind through the hills and climb up the mountain road to Montserrat. Along the way, hear how the famous mountain earned its name, which means the ‘Jagged Mountain’, and learn about its spiritual significance as you arrive at the mountaintop Montserrat monastery. On arrival, enjoy a guided tour of the Benedictine monastery, including a visit to the Basilica to see the famous Black Madonna. Continue exploring the surrounding natural park, where you can admire spectacular views over the Catalan countryside and visit the Holy Cave. Finish your visit with a performance of the legendary La Escolania de Montserrat, one of the oldest and most renowned boys' choirs in Europe. After lunch (own expense), jump back in the minivan for a drive through the idyllic Penedes wine region and hear how Catalan specialty Cava is produced as you wind through the vineyards. Stop to visit the Cava capital of Sant Sadurní d'Anoia, where you’ll have the option to enjoy a guided tour and tasting at the prestigious Codorniu winery (own expense), where you can sample a variety of fine sparkling wines and perhaps purchase some bottles to take away with you. Back in Barcelona, your tour ends with drop-off at your hotel. Great tour. The cava tour was the highlight of the day. An absolute must see. You will not regret this day! Excellent!! Great, friendly and knowledgeable guide. Lots of fun and well worth the added expense to have a private driver and guide there were three of us and not be on a large tour bus!